For the final weeks of the campaign, we’re adding a feature courtesy of our graphics designer Sharon Machlis. It’s the “tilegram” electoral map displayed on the left, portraying the state of the Electoral College based on aggregate state polling. I will update the map regularly and display it in the right sidebar, where you can click on the figure to see a full-page version. Expect polling to increase in volume as the election nears, and as we approach Election Day we should be able to project the likely outcome with increasing certainty. The tiles reflect the number of electoral votes awarded to each state, allowing a clear visual representation of the state of the race without the distorting effect of geography. 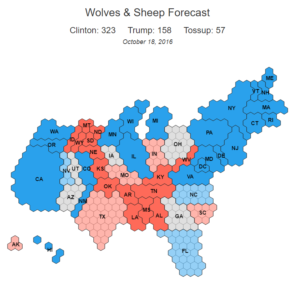 A glance at the map makes it clear, for instance, that the combined electoral value of the five interior states of North Dakota, South Dakota, Wyoming, Montana and Idaho—all Trump strongholds—is equivalent to the value of Georgia, which is historically a Republican state but this year is too close to call. Mouse over the states in the enlarged version to find the percentage of the popular vote won by Obama in 2008, the last time there was an open seat. The map depicts the regions where each candidate is strong: Clinton in the Democratic strongholds of New England, the Acela corridor, the upper Midwest and the Pacific Rim; Trump in Appalachia, the deep South, the Great Plains and the Rocky Mountain West. Clinton’s base regions are more populated, so she has more tiles (and is more likely to be elected). The map also shows how Trump is underperforming in traditional Republican regions and in swing states. Ohio and Iowa are his best bets to win states carried by Obama, but this is offset by weaknesses in Georgia, Arizona and Utah (where he is deeply unpopular with the large Mormon population), and in the swing states of Florida, North Carolina and Nevada, where recent polling puts him at a disadvantage. And keep an eye on the states shaded light red (South Carolina, Indiana, Missouri, Texas and Alaska). If the election were held today Trump would win them narrowly, but we are one Access Hollywood video away from moving them to the contested category.